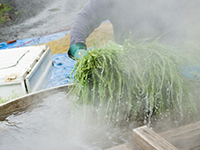 Whether or not we can make a good broom depends on the number of broomcorn that meets our quality standards. We cannot skip the step of making the soil healthy, as otherwise the plants won’t grow properly. We use stems of broomcorn from the previous year and plow the soil thoroughly. Additionally, we invest a lot of time in removing weeds, since we do not use any agricultural chemicals. We continue the process of removing weeds until the broomcorn is well grown. There is a lot of hard work that we have to do in our large fields, but it is important for our principles to be a sustainable and eco-friendly craft maker. Sowing is also an important process. We sow each seed and place it into the soil while paying attention to the distance and density of the seeds. If the distance is too close or the density too high, it causes too much stress for the seeds while growing. This process should be done on dry soil, so that the seeds germinate easier. 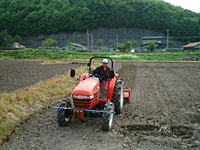 Ideally, it should rain after sowing, so we always check the weather carefully. 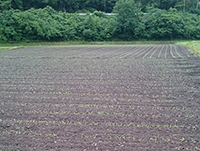 In years past, Japan had a calm climate during Spring, but in recent years it has become unpredictable; the intervals of rain are more frequent which means that the soil is mostly wet. Additionally, sudden drops in temperature can affect the plants. Every year we face a new challenge. It may seem like routine work, but it is not. It is important to us to listen to nature. We reap broomcorn when they mature and the field becomes green. 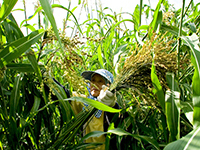 Healthy broomcorn can grow to three meters or more. We are very proud when we walk between them, but it also marks the start of our physical labour. We reap the tips by hand because the wavy tips of the broomcorn are the most important characteristic and reaping with a machine might cause damage to the tips. We continue reaping and carrying the broomcorn out of the fields for one and a half months with 5 workers. We spend the whole summer and early autumn on this task. 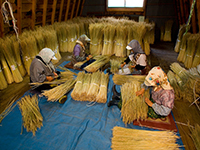 After harvesting, we check the tip of each straw to see if they are suitable to use for Nanbuhouki or not. Next, we band the straws together and thresh them. After that, the broomcorns are hulled before being blanched to achieve their color. Soon afterwards, we dry them under the sun. If the broom corn take too long to dry, they might start to mold. Therefore, it is important to read the weather accordingly. 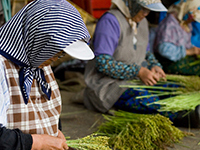 Dried broomcorn are sorted and divided into 15 levels, based on structure, length and thickness. Sometimes it takes over 3 years to assemble a single broom with the broomcorn that has the characteristic strong wave on its tip. Weaving and stitching are then done in the winter. 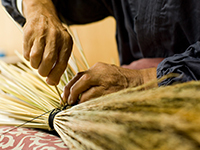 Some workers are responsible for weaving and stitching, while other workers are responsible for tightening the brooms. Weaving and stitching are labour-intensive tasks, but at the same time it is delicate work because fine thread is being used. That is a year at Takakura Kogei. When customers provide us with feedback after using our Nanbuhouki, it is the most precious and exciting moment for us, and it helps us to develop and improve our business. We will keep listening to what our customers tell us and we will be the Takakura Kogei loved by customers. Copyright © NANBUHOUKI All Rights Reserved.